I've gotten into the Spring cleaning mode! Have you? I spent this rainy & cold weekend getting a head start on my Spring cleaning. We have a half bathroom in our basement that gets used quite often. But the tiles in it are old and no matter what we've tried (and let me tell you, we have tried! ), getting the tiles & grout to look good was always so difficult. So I took to Pinterest to see what I could find! This attempt was pretty solid but would have worked better on grout that wasn't nearly as awful as ours was! 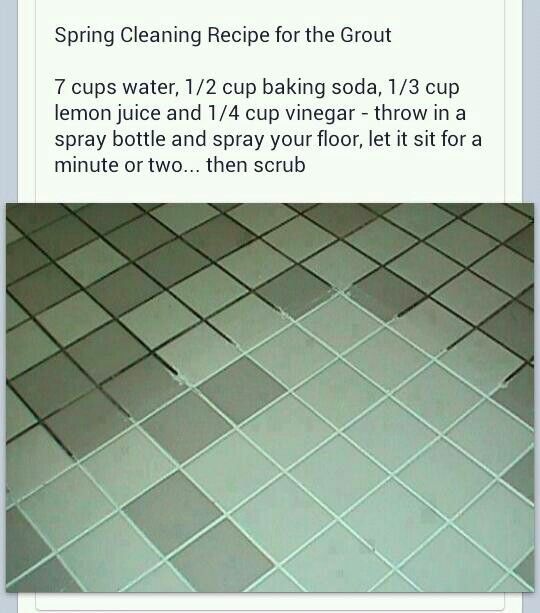 Mix it well in a spray bottle, spray, let sit for a few minutes and scrub! But like I said, this grout was bad!! After I scrubbed with a sponge, brillo & an old toothbrush, I took some bleach and let it sit as well and repeated my scrubbing. Then I mopped it up and let it dry out. I think if this was used on grout that didn't have years of build up like this one, this mixture would be more successful! I recommend using a toothbrush to really get in there. Don't forget to make sure you have a fan on, or window open to help with the ventilation. Especially do this if you choose to use bleach too like I did. You don't want to be inhaling all of this for too long! So take breaks, get some fresh air and keep the cleaning going! For the original pin, please click here! Diana has shared her story with us as to why she participates in Relay for Life. After being diagnosed with Hodgkins Lymphoma last year, she is cancer free! Now, she's working with the American Cancer Society to share her uplifting & heartwarming story. Take the next 5 minutes to watch it, you'll be happy you did! "I Relay for those who have left us too early." "What's important is that you be the best person you can be in this world. You want to leave a positive influence on generations to come." Those were a few of the final words from a 2010 phone interview I did as a sports reporter for The Journal News with Clarkstown and Condors swim coach Keith Furey. Keith was a breath of fresh air for me as I embarked on an uphill journey in a very male-dominated industry after graduating from college. While other high school coaches harped upon my inexperience in the field, Keith immediately saw my potential. He took it upon himself the first day we met to teach me the ins and outs of the sport of swimming. In little time at all, I quickly learned that he was an icon in Rockland County; not only was he a “family” man, devoted to his wife, five children and grandson, but was an inspiration to the community as an entrepreneur of his own engineering firm, as a Boy Scout volunteer for Troop 79, and as a parishioner of St. Augustine’s. And in just a few weeks of knowing him, he shared his secret with me. In 2009, after experiencing persistent gastrointestinal issues, he had been diagnosed with cancer. After almost a year in remission, his cancer returned in August 2010 and was deemed widespread by his doctors. After meeting me though and learning that my dad was also a cancer survivor, he didn’t want to keep it a secret anymore. He wanted to share his story with the community and give others the strength to battle on. anecdotes from his himself, as well as family, friends and peers - was published in The Journal News and received exceptional praise. It hit the community hard, to know that someone with such positivity was struggling with so much heartache. I witnessed Keith be a true hero the day of the boys sectional swim meet at Felix Festa Middle School. Besides working all day at his engineering firm, he had endured another cycle of chemotherapy and was still being fed medicine through a portable pump during the meet. Through everything though, his smile never faded once that day. at work to write his obituary. Keith, at the age of 48, had succumbed around 2:30 am in his New City home, surrounded by his close-knit family. While my editor considered it an honor to be asked to do so, I was physically sick to my stomach. Sitting at my computer with tears rolling down my face, I had to find the strength to write about a man who had become my mentor and my friend. This past November, we found out from doctors that my younger sister Diana was diagnosed with Hodgkin’s Lymphoma. I began thinking about the journeys, both good and bad, that those around me with cancer had endured, including my dad, my mom’s friend, my best friend’s aunt, my cousins’ grandmother, and of course Keith’s. I could only hope that Diana would come out stronger mentally, physically and emotionally than when she went in, and thankfully she did. Her 20th birthday in March of this year gave us another reason to celebrate, as she was declared cancer-free after just 6 treatments by her doctors at Memorial Sloan Kettering. plan. Please join myself and my family and friends this year in our Relay for Life efforts and in support of the American Cancer Society. One of my favorite websites is called Swag Bucks. It's a great place to earn free 'money' for doing simple things! You can do different tasks like surveys, polls, watching videos, playing games or shopping to earn what they call swags. They have different special offers too where you can earn big swags! I once got 800 swags for signing up for a free one month trial with Netflix. So easy! You can then redeem your swags for prizes or gift cards! I've been doing this for a few years and I've earned a couple hundred dollars in gift cards. I try and redeem them before the holidays to places like Amazon or even just PayPal so shopping for loved ones becomes a little more affordable! They have lots of different gift cards & prizes for you to choose from! To start earning swags, click here! A beautiful story written by an Anonymous Relay for Life member! unfortunately, numerous family members, friends, neighbors and co-workers who have gone through personal battles with cancer. I have supported them in the ways I have known how to, and being a member of Relay for Life is on of those ways. I remember the night I found a lump in my left breast. I have always been really good about giving myself regular breast exams for years. This particular time, I was making popcorn in my kitchen when I chose to do my exam. I figured I had a few minutes to spare, so why not? And there it was, it was hard & very round. It was as though somebody implanted a marble for me to find in a sneaky game of hide and seek. I took a deep breath, grabbed my popcorn and headed to my computer. I'm not one to really look up symptoms online, I always end up diagnosing myself with 10 different tragic diseases within 5 minutes. Instead, I went to the American Cancer Society website for more information with what I should do next. Just as I thought, they had all the information I needed at the time. I made an appointment with my physician and when I saw him, I explained what I found and he gave me an extensive breast exam. He sent me to get an ultra sound a few days later. After my ultra sound, the breast specialist scheduled me for a biopsy for a week later where a pathologist would determine on the spot if the lump was cancerous, because they were unable to tell from the ultra sound alone. The breast specialist was amazing, so kind and was right there in my corner. She gave me her personal cell number and told me to call, regardless of the time, if I needed to talk. She made me feel like I wasn't in this alone. I am fortunate enough to say that my lump is currently not cancerous, although as long as it remains there, I'll get it checked regularly with hopes it remains just a lump. I am thankful that my lump is just that, a lump. But it made me realize that without extensive research that is greatly funded by the American Cancer Society, the quick process to find out what was going on could have been a lot ore difficult with unanswered questions. I am proud to say that I have found my own lump because I have been taught the proper way to do a self breast exam. But without research and the availability of information from doctors or websites like cancer.org, many might not find a lump in time. So that's one of the reasons why I relay. Because knowing the different cancer preventions, self exams and where I can go for more information & resources is extremely important. The American Cancer Society has done such a tremendous job with making sure so much information is available, that support groups and incredible programs are set up for those who need them. I'm proud to be a Relay participant knowing my donations are helping research, programs and support groups thrive! It feels great to be a Relay member, knowing I'm a part of such a great cause. I obviously love all the products I make, and I love my makeup cases for so many reasons! I have made myself a bunch of these, in different sizes too, and I use them all the time! I store makeup in them (obviously) but they're also perfect for backup items for your car, or work bag. I have a backup set of makeup, contacts & contact solution, hair ties, feminine products and everything in between that I keep stored in my car and work bag for those 'just in case' moments. But don't stop there! You can use them for anything. Use them to keep pens/pencils, notepads and notes organized in your bag when you're on the go. Less scrambling for you when you need to jot something down! They make awesome gifts for girls and women at any age! You can even custom order makeup cases for bachelorette parties to fill with gifts for guests, or even as bridal party gifts! We can make you bridal party 'survival kits' for your big day! If you order 6 or more bridal survival kits, you'll get a free one for the bride! So go ahead, do some shopping, place a custom order or ask us a question! Remember, for every purchase made, $1 will automatically be donated to the American Cancer Society! All our makeup cases & sets are on sale at our online store!! This unique looking, young Australian Blue Heeler/Cattle Dog was rescued from a high kill shelter. Initially he was very shy but in a few short weeks he has really blossomed into an amazing, sweet dog! He does well with most other dogs and being a working breed, would love an active home with a big yard to romp and play in! I decided last weekend to try my hand at candle making. I hopped over to AC Moore, to get what I needed and took a whack at it! After 2 very messy & ugly attempts, I finally got the hang of it! So here are some tips to making some great homemade candles! I had a bunch of terracotta pots that I had bought at a garage sale for an incredible deal. So before I made my candles, I painted them and sealed them on the inside and outside with Modge Podge. Once they were all super dry, I began my candle making! If you're going to use terracotta pots like I did, before you start take some duct tape and tape the hole on the bottom. I didn't for my first one and there was just an explosion of wax everywhere. You can always re-use an old candle jar after you remove the wax from it. See how you can remove wax here! Grab some rubber bands because they'll help you keep your wick in place. Place your wick in your container and put one rubber band on each side of the wick to help keep it centered. This was where I made the mess. I chose to use the microwave approach. Make sure you're using an old bowl that you don't mind throwing away. Using a metal bowl would probably be your best bet because you can most likely get all the wax out. You're also going to want to use an old dish towel or 2 to catch some dripping wax! Follow the instructions on your wax bag. I used a soy wax from AC Moore. Make sure you're stirring every 30 second interval or so. Make sure to super melt your wax. I thought my wax was melted enough, and it just wasn't. Because my wax wasn't melted enough on this first attempt, it was hard to pour and it got everywhere!!!!! This is what my candle looked like post pouring. I had my sister come down, she's made candles once before. She had me melt the wax even more. Let it become very liquid-y, and almost clear. It should really thin out and you'll realize quickly that it'll be easy to pour! Before you pour, add scents if you're using some and stir it. Pour it into your container, you might have to readjust your wick for it to remain center. Once you pour, you're almost done! Now you just let them sit to cool and set. I left my wicks tall and my rubber bands on until my candles were completely cooled. Once they were cooled, I trimmed my wick, removed the bands & duct tape and burned away! This is a great craft to do with the whole family. Have each person decorate their container, you can use paint or old newspapers/magazines to do a decoupage or even stickers! Each person can choose their scents and create something that's useable, fun & it can make a great gift too! Cutting out carbs is without a doubt the hardest thing for me. I love a big bowl of pasta and pizza, sometimes together. Give me garlic bread or any kind of bread for that matter and I'm a happy girl. But I do realize that the amount of pasta and breads I eat needs to be limited as often as possible. I got this one idea from a friend who was also trying to lose weight as well. If she wanted a sandwich, she had it open faced. Literally as simple as that. Cutting out one slice of bread a few times a week does add up. So that's what I try to do, eat open faced sandwiches if I'm craving one. When I want a veggie burger, I'll cut my slice of bread in half, as well as my veggie burger. I'll stack it up and make a higher sandwich. That makes it a little easier to eat too. So don't feel like you have to completely cut out foods you absolutely love. Instead, find ways where you can eat them in moderation. Maybe make the choice to have of toast every other day, but instead of having multiple slices, just have one. And change it from white bread to something healthier like whole wheat. Make small changes in the way you eat to make bigger changes in the way you look and feel!